If reaching conclusions based on a single season of evidence when players were at different clubs is your thing, then you’ll be delighted to see that Cech is a hell of a lot better than the other two, and thus a vast improvement. To be fair, stats or not, he is definitely better. The stats suggest that Szczesny is really not all that good. Some Arsenal fans think he is very good, but even those people tend to steer clear of saying he’s better than Cech. They believe – or hope – that Chezzer will learn from the master and become the world class keeper his raw talent suggests he should. Well I am here to tell you that Szczesny won’t become world class. Being truly world class takes either an utterly outrageous talent – George Best, say, or Johan Cruyff, players so good they could smoke and drink to their heart’s (dis)content and still leave everyone else trailing – or a lot of talent and the capacity and focus for utterly single-minded determination. Szczesny is talented, but he’s no maverick genius like Best or Cruyff. And unfortunately he does not have the mental side either, and at his age he’s not going to learn it. He can of course be a much better keeper than he’s been so far, but he’ll never be as good as Cech (or Seaman or Schmeichel, to name the three best keepers of the last 20 years to play in England). Whether Szczesny is a better keeper than Ospina is another matter. They both have their faults, but at least Ospina is less likely to get ash on you as you come out of the shower. The Times also note that Cech holds the Premier League record for clean sheets in a season, with 24, and is seven behind David James in total clean sheets in the PL. It doesn’t say how many unclean sheets David James had. Probably more than Cech. Is Walcott any good and is Özil better than Bergkamp? What do the stats say? ← Are Arsenal Making ‘Progress’? Quite right – Szczesny is just not good enough and there is no sign that he will be. 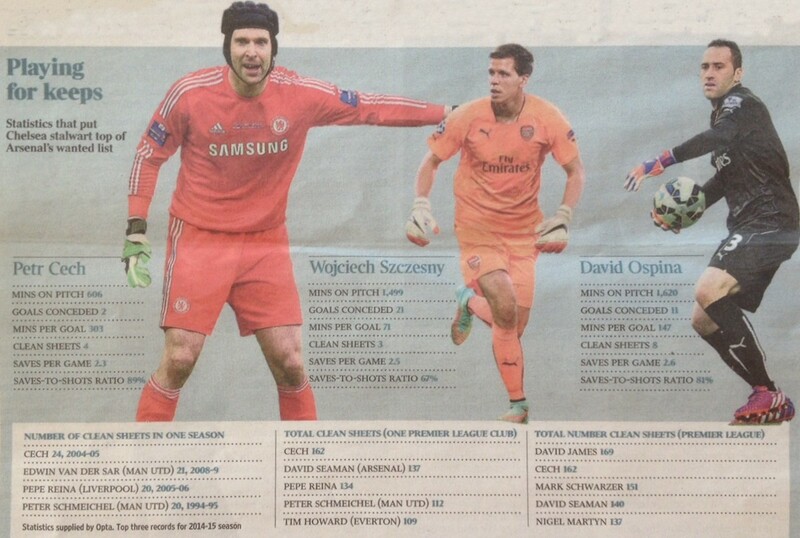 Cech is clearly going to be the starter next year. Not just for his personal performance in terms of saves, but I suspect also because Wenger wants his strength and authority to organize the defense in from of him. This was a clear weakness a set plays last year and also in transition defense. If I were Wenger I would flog Sxczesny off as soon as possible. And get on my knees to beg Ospina to stay. At Cech’s age he cant play all the premiership games so theres games to be had for a bacup keeper, plus some in the cups and the champions league. However that wont be easy, as Szczesny is on a Denilson-type contract – more in fact, at 80K per week. No club outside the top four in England (and maybe two in Italy) would pay that much for a goalkeeper. Of those six clubs he has already failed at one. And wouldnt be a starter at any of the others. So he probably goes out on loan next year or hangs around as a miserable and expensive third choice. Which makes no sense. Emiliano Martínez can probably do anything Szczesny would offer as a third choice. And looks far more promising. Absolutely spot on. Szczesny neither has the exceptional talent some attribute to him, nor the mental toughness necessary to become a top GK. But despite the nightmare season he had, he still enjoys the ardent support of a section of our fans, including that of some “mainstream” Arsenal bloggers, who like to emphasise how Cech’s arrival will benefit the Pole. Maybe I am missing something, but it is weird that some fans seem to be more interested in seeing Szcz finally succeed at the club rather than focus on what’s best for the Arsenal. But the cold, hard facts are that he had 1 good season in 4 and, after playing 181 games for the club, he could not establish himself as No.1. I also think that the idea that Cech’s “mentoring” will make the difference to Szcz finally realising his (perceived) potential is somewhat naive. First of all, they will be rivals and Cech will want to keep the No.1 spot for the next four years. Second, if Szcz really had that world class talent, at the age of 25 he should not rely on learning from a more experienced keeper. I mean, did de Gea or Courtois (both younger than Szcz) need any “mentoring” from a senior player to become the quality GKs they are today? But I guess his HG status is a decisive factor in keeping him instead of Ospina, so we should just hope that he responds well to competition and can deliver when he is called upon.